Miss Julie - One Of a kind -13"
Miss Julie es preciosa y se la ve muy coqueta con ese precioso lacito. dell'altro e Miss Julie è tenerissima! Grazie Susy! Sono così contenta che i miei orsi ti piacciano!!! E' un piacere ricevere i tuoi complimenti, così come allo stesso modo è piacevole leggerti sul tuo bellissimo blog! Julie is really a most charming ladybear, with her, spring can begin !! Wish you a very happy Easter!!! Thank you Leny! Happy Easter to you too! Grazie Susy! Tanti auguri anche a te di una serena Pasqua! I wish you a very sunny and happy easter !! 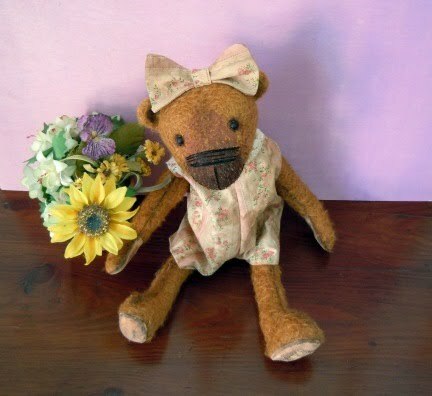 a very lovely girly spring bear! Ciao, wishing you a wonderful weekend dear Miss Petula Pie! !